The Danish implementation of human rights decisions is a complex matter that revolves around three interdependent variables. First of all, human rights obligations derive from a variety of sources that have different status in Danish law, namely obligations under the Council of Europe, the European Union and the United Nations. Second, the obligations can be implemented in different ways. And third, different institutions handle international human rights obligations in different ways. Accordingly, it is a topic with several dimensions. The aim of the article is to provide an overview of these dimensions, despite the complexity. The starting point of the implementation of decisions rendered under different international instruments is the formal status of the human rights treaties, as well as the power of the decision-making body. The domestic effect of statements of UN treaty bodies differs from that of judgments of European courts, but the difference should not be overestimated as Danish law provides several examples of significant impact of non-binding decisions, statements, etc. Next, the varying legislative implementation of human rights instruments and decisions will be analysed with a view to determining the significance hereof. Finally, practice of different institutions will be taken into account such as the Refugee Board, the Equality Board, the Ombudsman, the National Human Rights Institution, the legislator and the judiciary. 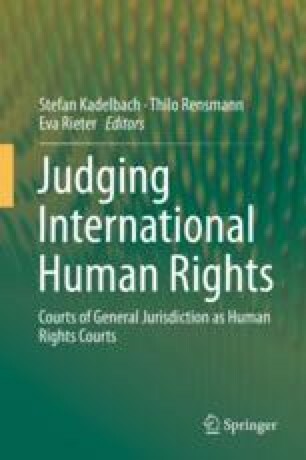 The overall conclusion is that Danish law also in the field of human rights implementation is very pragmatic and goes a very long way to ensuring de facto implementation of Denmark’s human rights obligation as they are reflected in international decisions, whether rendered vis-à-vis Denmark or other countries.